"If exercise could be packed into a pill, it would be the single most widely prescribed and beneficial medicine in the world." 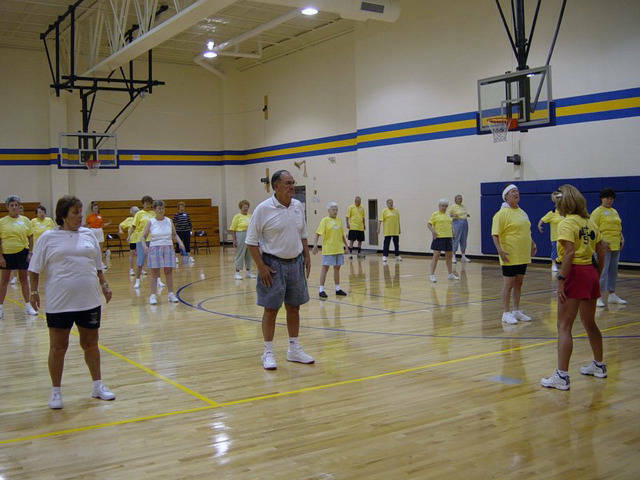 Responding to parishioners' request for an exercise class for people 50 years and older, "Fit over 50" began on August 15, 2004. A Steering Committee, which included a certified fitness instructor, a physical therapist, and a physician, developed an exercise program specifically with seniors in mind. Participants must be 50 years of age or older. Exercises are low impact and modified to benefit most seniors. The majority of the exercises are performed standing. Two-inch thick foam mats are provided for floor exercises. Participants may choose to sit in a chair and do sitting exercises if they are unable to get onto the floor. Participants must sign a waiver, and have physician approval. If a physician places restrictions on a participant, the instructor will inform the participant how to stay within recommended limitations. It is the participant's responsibility to monitor their own restrictions. For more information call the Parish Office at (812) 490-1000. Increase flexibility: Gentle, active stretching to major joints in standing, sitting and (if desired/able) lying on back and abdomen. Increase cardiovascular endurance: Participants are educated on how to take their resting heart rate. Aerobic exercise is used to gradually increase heart rate. Using guidelines from the National Institute on Aging, participants work toward reaching 70-85% of their target heart rate, unless restricted by their physician. Heart rate is taken periodically and perceived rate of exertion ("how do you feel?") is used to determine how hard one is working. Increase strength: Participants may use 1-5 pound free weights to build upper body strength. The instructor will assist participants in choosing appropriate weights. Elastic exercise bands in various ranges of resistance are also used. Improve balance: Upright balance activities are performed approximately two times per month to challenge and improve standing balance. Tuesday 10:00 – 11:15 A.M.
Friday 8:00 – 9:15 A.M.
Class times may vary - please check bulletin!